USDA's Economic Research Service reported in December that "2008 has proven to be another good year for the U.S. farm economy as a whole, driven by strong demand for feed crops, oilseeds, and food grains." The annual Agricultural Income and Finance Outlook Report, by J. Michael Harris and more than a dozen colleagues, organizes the data in a clear way. 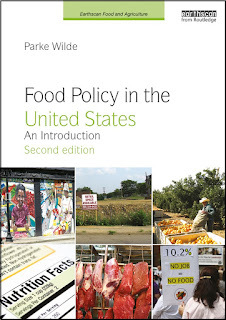 Other writers often use total sales statistics to compare different sectors of the agricultural economy. USDA's economists, by contrast, give greater emphasis to "net value added," which is a measure of how much economic value is contributed by agricultural producers, beyond the value of the inputs they use. For example, meat and dairy production account for almost 50% of total sales, but much of that value comes from the value of the feed grains and soybeans that are used as animal feed. It is better to measure the meat and dairy industries by their economic contribution above and beyond the value of the animal feed. 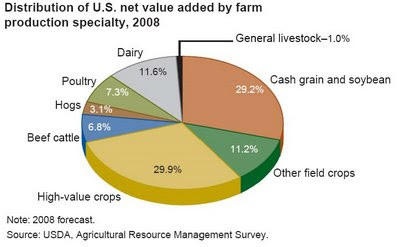 When the contributions of different sectors are measured by value added in USDA's nice clear charts, the big surprise is that the meat and dairy industries are no more important than "cash grain and soybeans" or "high-value crops" such as fruits and vegetables. 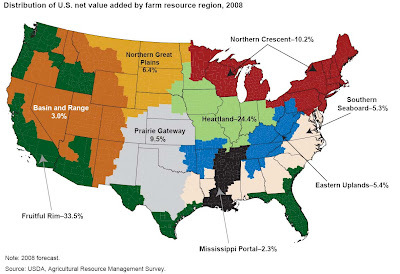 When different regions of U.S. agriculture are compared, similarly, the big surprise is that the "fruitful rim," including California and Florida, make a substantially bigger economic contribution than the "heartland," even though the latter region gets the largest share of USDA subsidies (click image for larger view).